Aftek Limited is a full spectrum technology services company from India. 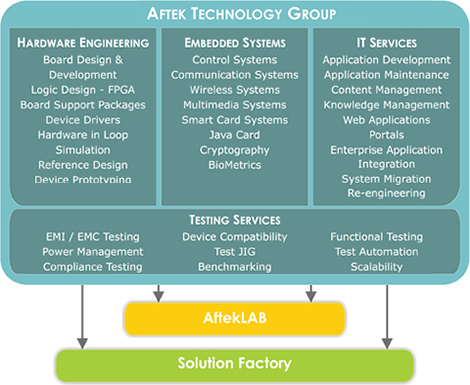 AFTEK stands for AFfordable TEKnology. Core of Aftek Limited is Aftek technology group. Over last 20 years Aftek has gained significant exposure to variety of technologies. Rich technological capabilities, focused investments in research & development and industry exposure enables us to reach beyond the basic IT services to design and deliver projects, products and implement end-to-end solutions to customers in variety of industries. We specialize in end-to-end services. Our service spectrum covers key services as application development, application maintenance, hardware development, firmware development, embedded systems and testing services. We are an optimum sized company in the context of Indian IT Services companies. That allows us to be more flexible and cater to each customer in a more personalized manner. We focus on a strong customer relationship and delivery ownership. We act as true development partners to our customers. View our elite customer listing. Android competence center is launched with a focus on developing frameworks, components and android applications right from hardware to applications. Similarly, mobile competence center focuses on developing specialized mobile products and applications across platforms. AftekLab highlights some of the lab work going on as we speak! Intelligent Transport System is designed for the urban / state / private road transport organizations. This system consists of a backend and a hardware component to provide an integrated solution for the driver console unit, electronic ticking machine, passenger information system and vehicle tracking system. ITS aims to offer a single solution for transport companies to schedule and monitor buses with the help of advance technologies such as GPS, Wi-Fi and GPRS. "On behalf of all the members of 'TECHNOTRYST', the inter-collegiate technical event held in Cummins College Of Engineering For Women, I would like to express our thanks for sharing your vision and knowledge with us. With your gracious presence this event was a grand success. The session on Mobile Application Development and the workshop on Android, were appreciated by all. I especially appreciate your willingness for sharing your knowledge and spending time with the budding engineers. On the same line I would thank you for all the efforts you have taken for the workshop".